MEET THE PRESS: Sponsors, organisers and top entertainers Usher and Gramps Morgan sat on the panel of the 2010 Reggae Sumfest Press Conference last Friday at the Iberostar in Rose Hall to offer thoughts on this year’s staging of the festival and the benefits for all. HEAD TABLE: Johnny Gourzong of Summerfest Productions; Usher’s road manager; Usher, Gramps Morgan and Robert Russell of Summerfest Productions. 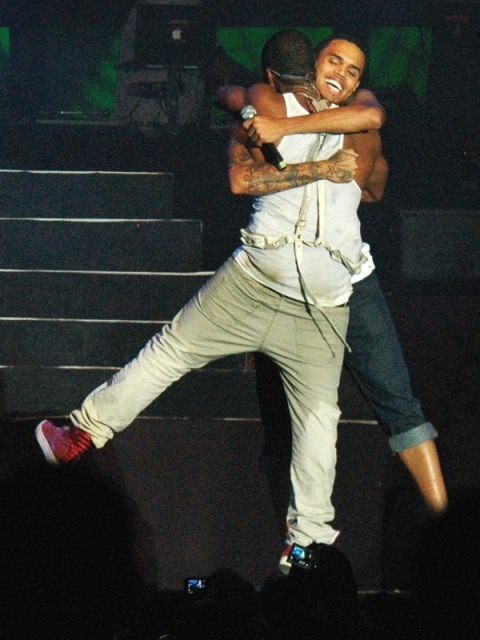 USHER and CHRIS BROWN on stage together in Jamaica: The most memorable moment in ‘Sumfest’ history? Reggae Sumfest really struck a chord this year. Local pop and R&B fans got a fantastic surprise last Saturday night when two of the world’s biggest entertainment sensations, Usher and Chris Brown, shared the stage and launched into an exhilarating, is-this-really-happening stint alongside Elephant Man that lasted for close to ten minutes. For many in the crowd who witnessed the spectacle at Catherine Hall, it was the most memorable moment of the three-day Reggae Sumfest and the indubitable highlight of International Night II – and probably one of the most memorable in the history of the long-running Greatest Reggae Show On Earth, according to the event’s organizers. Reggae Sumfest 2010 had no shortage of highlights: Etana, Romain Virgo, Gramps Morgan and Shaggy all gave strong performances, and hosts like Paula Ann Porter-Jones, Richie B and Francois St. Juste brought the engaging banter, especially in between the lengthy band changes. (Don’t even get me started on the long breaks for the band changes). And a few other star-shaped statues could be given out as well to performers like Beenie Man and Vybz Kartel. But the key moment worth remembering was all about R&B’s biggest male stars shining their brightest on stage. Both headliners, Usher and Chris Brown, also reportedly recorded a song at a studio in Montego Bay before they left the island. (Can’t wait to hear that track! I hope it’s nothing disappointing like that silly Alicia Keys-Beyonce duet “Put It In A Love Song”). What a fitting close their successful trip to Jamaica! 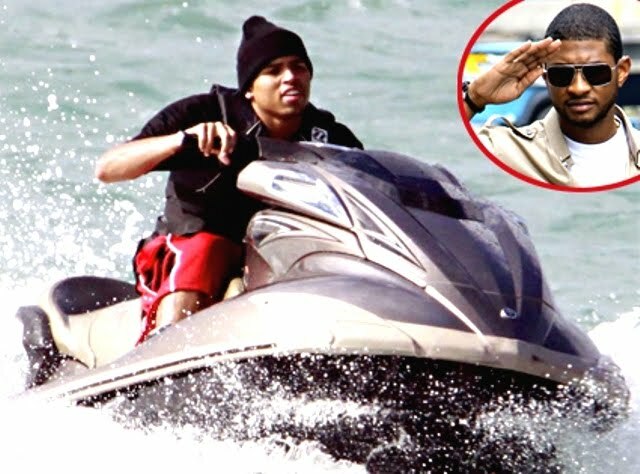 Sidebar/Flashback: Not to throw shade or rain on their parade, but do you remember during the Rihanna-Chris Brown scandal last year, when Chris Brown went out jet-skiing in Miami and Usher reacted to the photos by totally criticizing him with: "C'mon, Chris. Have a little bit of remorse, man. The man's on jet skis? Like, just relaxing in Miami?" Jamaica Youth Theatre’s Graffiti was an extremely polished performance. The company leapt onto stage brandishing cans of spray paint and kept the pace high throughout this exploration of self-expression. Nothing is wasted in this piece, the performers often using their own bodies in place of set or props (at one point collectively creating a train, a car and then a bus). However, at one point a simple red sash was used to dramatic effect, creating a stream of blood, a washing line and a rope binding corpses together. The dialogue (chanted, rapped and sung) is engaging in both its unusual delivery and clever wordplay although occasionally a touch repetitive. The company shine brightest during the dance sections, moving in unison and creating a real carnival atmosphere. By the time a reggae number rolls round towards the end of the piece, the auditorium feels like one huge party. This is no flimsy feel-good performance though; there are powerful messages about unity and acceptance delivered with maturity by these talented young people. LMAO. Her huge exaggerations aside, Sharlene is such a funny lady; she never fails to crack me up! 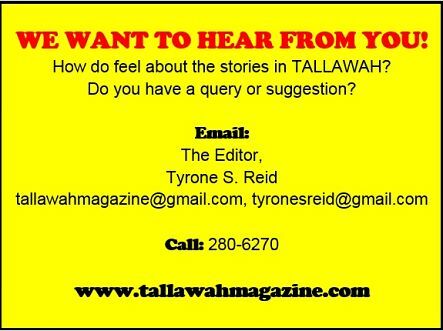 Personally, however, it’s quite liberating to know that the opinions of others (on certain issues) never matter to me. I am unflappable. Some things are just immaterial. A lady in the office says Sharlene is just one of the bitter “haters”. Probably. More important, I don’t know who informed Sharlene that Chris Brown wanted people on the stage with him, when press insiders had learned well in advance that Chris Brown’s long list of diva requests included: photos permitted during his first two songs only; limited contact; and NO INTERVIEWS! The poor girl who climbed onto the stage during his performance, primed for a lapdance, got the embarrassment of her life when she was quickly escorted off the stage so that a backup dancer could take her place. Womp. Frankly, I love the attention; it’s good for my self-esteem – and my future memoirs. Thank you very much for attending my talk last Tuesday and for taking the time to write your thoughtful review of it on your website. It is most appreciated. As you note, Japansplash indeed was a great original driver of reggae's popularity in the 1980s and 90s. However, its influence has waned since its founder moved on to other things and another management group took it over. Since the late 1990s, the summer festivals arranged primarily around Japanese reggae artists (like Yokohama Reggae Festival, organized by Mighty Crown) have become more influential than the current version of Japansplash, which is much smaller than what it was in the 80s and 90s. It would be more accurate to say, "Japansplash, which attracts massive crowds annually, is considered to have been the single biggest driver in popularizing reggae in Japan in the 80s and 90s." While dancehall in Japan is indeed bigger than roots reggae now, as you point out, the roots reggae scene is actually still alive and well; it hasn't disappeared. I've seen some excellent club performances of Japanese roots reggae bands, especially around Kyoto and Osaka. In fact, some acts like Home Grown that perform alongside dancehall acts would actually consider themselves to be more roots reggae. Most Japanese dancehall artists will record 1-2 songs in the "roots" vein on their albums. Several other forms of Jamaican music are actively performed in Japan today—ska, dub, etc. I personally haven't seen any Japanese mento or Nyabinghi drum groups, but it's altogether possible that they exist. Minmi is actually a heterosexual female singer, not a gay entertainer. She became involved in a controversy because her track was used in a commercial featuring Ikko, the transgender entertainer. Mighty Crown has won the World Clash in Jamaica twice and in New York twice; their first big win was in 1999 in New York, against Killamanjaro. Outside of Japan among dancehall circles, they may be better known for these victories than for the Yokohama festival. Many thanks again for coming to my talk and writing your thoughtful review; I really appreciate it. SINGLE LADY NO MORE: Andre Morris certainly put a ring on it. 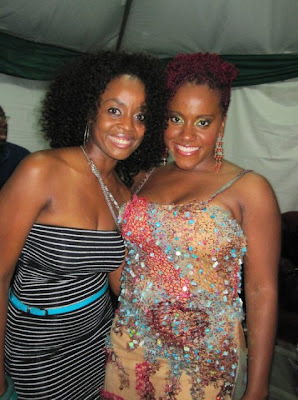 Etana was spotted flaunting her sparkly wedding ring both on the Sumfest stage and later in the press room, where she gave several interviews after her superb performance. (Of course, I'm sure she kept mum on her marriage and love life). What can I say? Real love is hard to find. 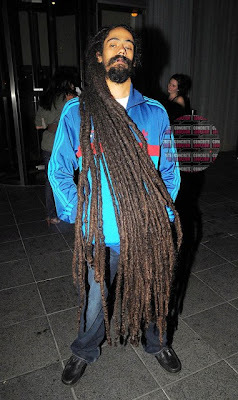 I AM NOT MY HAIR: Does reggae star Damian Marley have the world’s longest locks? If not, then he is definitely in the running for a spot in the Guinness Book. 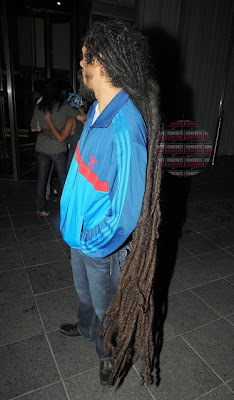 That’s a lot of hair. Homeboy was spotted in London, where he recently observed his 32nd birthday, holding court with his ultra-long dreads. How does he properly tend to that hair, especially for cleaning and overall caring? How uncomfortable does he get at times? How much does the hair weigh? What’s the actual length? The long list goes on… Somebody please fill me in. * Rumour Control: Lovebirds Etana and Andre Morris make it official?! REGGAE GIRLS RULE: Reggae-soul songbirds Cherine and Etana (and her wedding ring!) got close backstage after Etana's performance. Looking great, girls! SINGING THE BLUES: Rising reggae sensation Romain Virgo gave interviews after his thrilling time on stage. THE MIGHTY PEN: Singer Jah Cure got busy with the pen, obliging autograph seekers after his stint on stage. Jah Cure has had better performances. NATURAL MYSTIC: Reggae crooner Hezron chatted with CEE-TV in the press room. 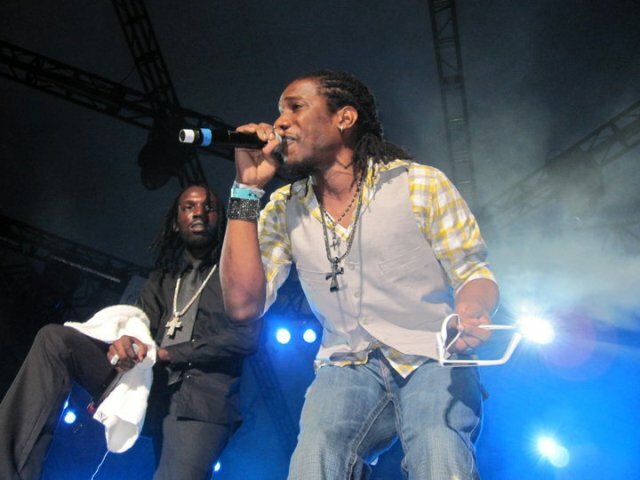 DOUBLE TROUBLE: Wayne Marshall and Mavado thrilled the Dancehall Night crowd with their summer anthem "My Heart". Big tune. HOTSHOTS: Dancehall kingpin Mavado entered the stage during Usher's set Saturday night to perform songs like "So Special". Is a collabo in the works? SUMMER MUSIC FESTIVAL RECAP: Over the weekend, 30,000-plus people gathered at Catherine Hall in Montego Bay for music, mud and many, many, many awesome performances. But what were the best – and worst – moments of this year’s Reggae Sumfest? FROM MY POETRY ARCHIVE: "Viola"